Please be advised that the road has been cleared. This hike begins off Forest Road 2324.063 which is off Forest Road 23. This approach to Sunrise Peak allows you to drive up much of the elevation. This hike is short but very very steep. Even though your first steps are downhill, don't let that fool you. The rest of the trail is straight UP! The hike begins in a very dense forest, but after about a half mile you break out into the open where you will remain for the balance of the hike. Wildflowers are extremely abundant in season and add a great deal of enjoyment to this hike. 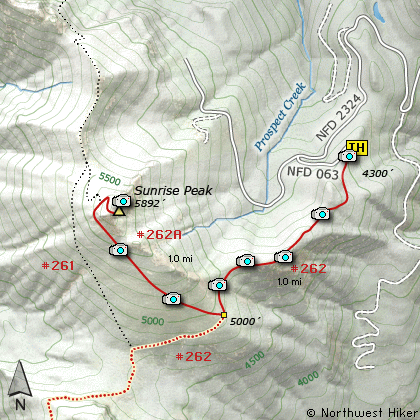 At about 1 mile you come to a junction that allows you to take Trail #261A to the top. Bear to the right and begin one of the steepest climbs you will encounter. With each step the views improve. The wildflowers help make all this worth the effort. In another half mile you will come to another junction to a different approach to the peak. Bear right and continue on to the top. The last 1/4 mile has a very steep grade with plenty of switchbacks to make it tolerable. To reach the very top you must climb up steep rock with a metal rail in place to help you. When on top you are treated to more beauty than the eye can behold. 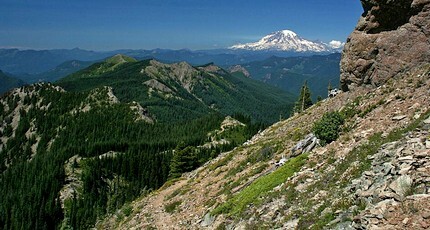 Mt Rainier, Mt Adams, and of course Mt St Helens. Its sooooo worth it! Travel east on US Hwy 12 for about 48 miles to Randle. From Randle, travel south on State Road 131, crossing the Cowlitz River and in a mile you will come to Cispus Road on your left. Bear left and follow Cispus Road, which become Forest Road 23, for another 5.2 miles and you will pass Forest Road 55 on your left. Continue on FR23 for another mile and you will pass Forest Road 083 on your left, which is the road to Layser Cave. But you keep straight ahead on FR23 for another 1.9 miles. You will then come to the junction of Forest Road 28. Just continue on FR23 for another 6.7 miles and you will come to Forest Road 171 on your left which takes you to the Blue Lake trailhead. But you continue south on SR23 for another 2.8 miles. Then you will come to the junction of Forest Road 21. Bear right and continue on FR23 as you cross the Cispus River. Drive another 4.5 miles to the junction of Forest Road 2324. Bear right onto FR2324 and follow this rocky and challenging road uphill for 5.3 miles. Then you will see Forest Road 063 on your left. Make a very sharp left turn onto FR063 and follow this short road uphill to the parking area for this and other hikes in the area.